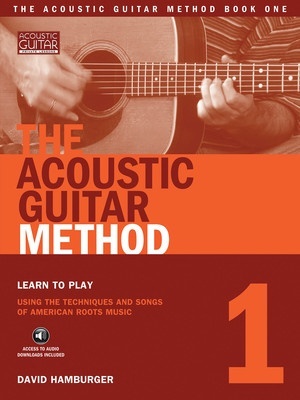 We're proud to present the first in a series of beginning method books that uses traditional American music to teach authentic techniques and songs. From the folk, blues and old-time music of yesterday have come the rock, country and jazz of today. Now you can begin understanding, playing and enjoying these essential traditions and styles on the instrument that truly represents American music: the acoustic guitar. Working in both tablature and standard notation, you'll learn how to find notes on the fingerboard, a variety of basic chords and strums, country backup basics, waltz time, and melodies with half notes and rests. When you're done with this method series, you'll know dozens of the tunes that form the backbone of American music and be able to play them using a variety of flatpicking and fingerpicking techniques. Songs: Man of Constant Sorrow • Columbus Stockade Blues • Careless Love • Get Along Home, Cindy • Sally Goodin • Ida Red • Darling Corey • Hot Corn, Cold Corn • East Virginia Blues • In the Pines • Banks of the Ohio • Scarborough Fair • Shady Grove. Each book includes access to online audio accompaniments for the many songs and exercises.